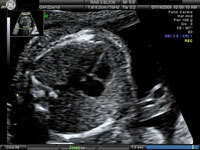 Profile view of a fetus on an echocardiogram What Is A Fetal Echocardiogram? A fetal echocardiogram is an in-depth study using high-frequency sound waves (ultrasound) to look at the structures of the fetal heart. It is used to detect heart defects and heart rhythm problems and to evaluate heart function. In most cases, the study is performed by placing an ultrasound transducer (a probe) on the mother's abdomen. 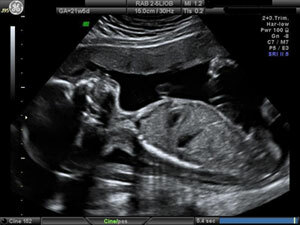 If the heart must be evaluated early in pregnancy, a vaginal ultrasound may be performed.